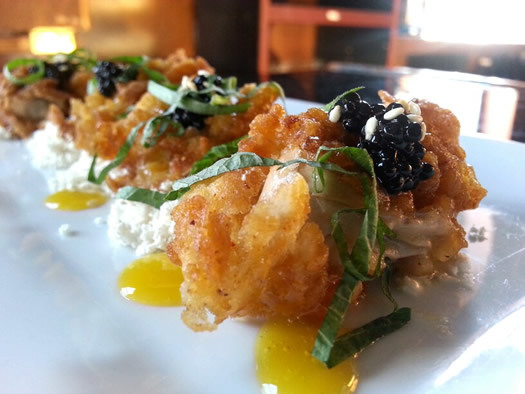 Most fried oysters at upscale restaurants in the area seem to follow a similar formula. And understandably so, as many variations on the dish extend from the same culinary family tree. The trunk of the tree has roots that run through McGuire's in Albany. Chefs Rick Weber, Andrew Plummer, and Brian Bowden all worked in the kitchen there with front-of-the-house maestro Paul McCullough. And as that group dispersed to various other ventures around the area -- Weber at the Troy Country Club; Plummer at Creo; Bowden at the Ginger Man, Creo, and Javier's; McCullough at the new 15 Church in Saratoga Springs (where Jason Baker is the chef) -- variations on the fried oyster dish have also made appearances. Essentially, these oysters are prepared in the same manner with similar plating elements: Batter-fried oysters, a remoulade or similar base sauce, caviar garnish. Other flourishes fluctuate (honey tabasco sauce, shaved and julienned radish, for example), but the gastronomical similarities are clear. Thankfully, they are all artfully crafted and delicious, and they run around the same price ($9). Certainly there are other restaurants that offer a spin on fried oysters -- Reel Seafood Co. in Colonie serves them with a buttermilk batter, roasted lemon, and jalapeno ranch dressing -- but the above formula seems to be the sweet-spot for fried oyster consumption among many Capital Region diners. 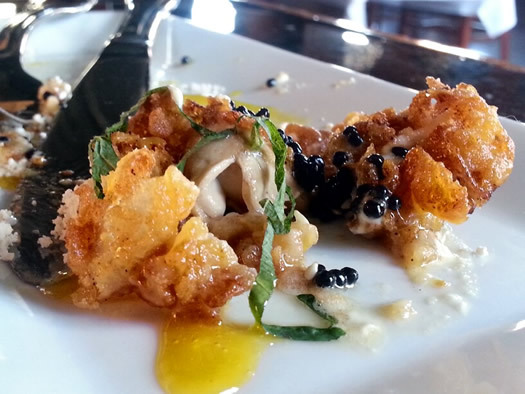 My first encounter with fried oysters at Javier's ended up being my favorite thing I ate in 2013. This was Brian Bowden's classic take on the dish, served in the fashion described above. 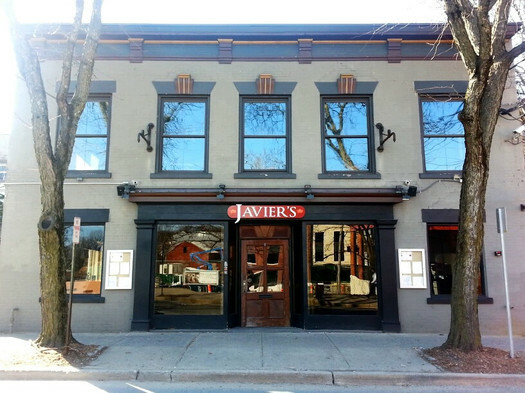 Anytime I was in Saratoga, I made it a point to stop into Javier's, sit at the bar (upstairs or down), and order the oysters with a crisp, lemony glass of Prosecco. A few oysters for nine dollars seems like a lot to pay per oyster, but once you factor in caviar, it is a fair, competitive price, and is surprisingly satisfying, like the Goldilocks of seafood: Not too filling, not too light, just enough to start a meal. Bowden is no longer at Javier's, but new executive chef Eric Sell is keeping oysters on his menu, with a different twist. Perhaps it took a Capital Region outsider to shake-up the tried-and-true oyster scene. Sell relies on his eleven years in Asia to bring new life to the dish that was already a top seller for Javier's. The new oysters at Javier's begin the same as the previous dish did, with a fried oyster (of course). Sell then relies on molecular gastronomy to turn sesame oil into a feather-light powder. Four beds of the sesame oil serve as a cradle for each crunchy oyster. Thankfully, Sell manages to keep the oyster tasting like oyster and not devoid of that briny, ocean quality. A little bit of natural liquor (that's the fancy word for oyster juice or liquid that nestles into the crevices) from the oyster remains through frying, maintaining its distinct, tender texture. From there, each oyster is graced with a generous kiss of caviar. (Though if you're looking for The Notebook-level kissing action with the caviar, you won't get it here. That level requires a hefty wallet, so go all in and order the $75 caviar tray). Sesame seeds and thinly-sliced shiso leaves are sprinkled across the top of the oysters, and a slightly spicy orange juice reduction finalizes the plate. Together, these elements combine to evoke the flavors of Chinese takeout, but better. The sweet-and-spicy sauce, the notes of sesame, the crispy and slightly chewy texture -- all that's lacking is the cardboard box and fried rice. The sesame powder can be a bit cloying, but that's only if you take all the powder off the plate. It is doubtful that Sell intends for you to press the back of your fork tines into the powder to get every last speck off the plate. You're going for the essence of sesame oil here, which lends to the characteristic Chinese takeout flavor mentioned earlier. 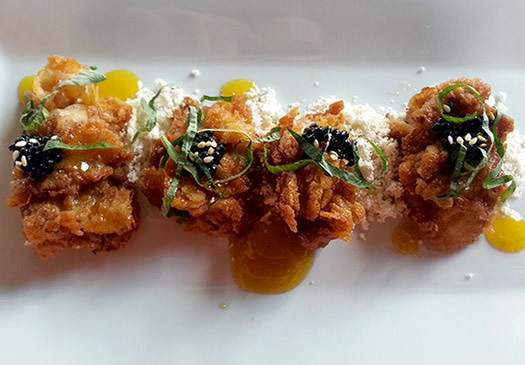 Comparing the traditional fried oyster to Sell's Asian-inspired dish is kind of like comparing oranges to tangerines. Sure, they're all related, but they are not really the same thing. Let's be clear: I'm not saying one is necessarily better than the other. I'm only noting that Sell's version is unique among the others. Javier's might seem imposing to many, reserved for special occasions and romantic nights out. Don't overlook it -- or the oysters -- as an option for evening cocktails at the downstairs bar. And if you are thinking of trying it, go now before the place is absolutely mobbed (like most of Saratoga) during track season. Deanna Fox writes about many things, mostly about food. More can be found on her website. Thanks for this appealing review of the new chef's prep. My only experience at Javier's was after Brian Bowden left, but while he was still advertised as the chef, and the result was underwhelming. This maybe the prod I need to give them another try. I've had Eric's fried oysters and they are sublime. @Burnt My Fingers - give it another go and see what happens. You know how that transitional period can be for any restaurant. @AddiesDad - Glad you liked it!! It's a nice interpretation on the otherwise ubiquitous (though delicious) dish.